Anthony Alcock has sent in another of his excellent translations from Coptic. This time it is a hagiographical text, the Martyrdom of Theodore the Anatolian, or Oriental. It is translated from a Bohairic Coptic text preserved in Codex Vaticanus 63 ff. 28-54. The text was edited by I. Balestri and H. Hyvernat in the Acta Martyrum (1907), p.34-62 (in the second half of the volume), with a Latin translation on p.30 f. This is online here. Most hagiographical texts belong to the 5-9th century; no doubt this does also. 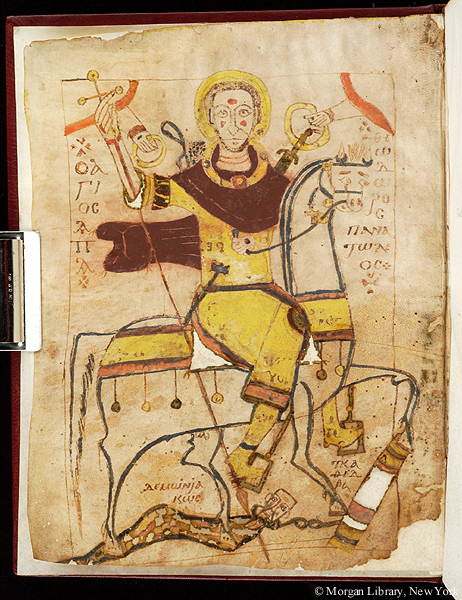 There is a plate from a 9th century Morgan collection manuscript, of which details are here and here, and which contains a version of the Life in Sahidic Coptic (facsimile online at Internet Archive here). The webpage labels him as Theodore Tiro. There seems to be quite a bit of confusion about the various lives of St Theodore, and whether he is one saint or two! There are several lives in Greek, listed in the Bibliotheca Hagiographica Graeca (BHG) entries 1760-1773. Unfortunately none of the material indicates which Greek life the Bohairic corresponds to. But it is useful to have this text in English! Thank you!